Not every great NHL player jumps straight into the league after being drafted. The draft is somewhat of a guessing game, as young players develop and refine their games at different ages and speeds. Some of the league’s top scorers, such as Calder Trophy winner Artemi Panarin, burst onto the scene without much fanfare. With the 2016 NHL Draft officially in the books and free agency underway, NHL clubs have had a chance to restock their prospect pools and make deals for established NHL talent. The 2015 NHL Draft brought two future superstars in Connor McDavid and Jack Eichel, but the rest of the draft was stacked with young players who have the potential to develop into great players in the professional ranks. While the top two picks were blowing by NHL defenders in their respective rookie seasons, many others were honing their craft in junior leagues, European professional leagues, and college hockey. The 2016 Draft, while not quite as highly regarded as the previous year, still boasted some fantastic young players going high in the draft. The second edition of this list rounds out the top prospects in the league, with the top young guns in the world falling near the top of this list. While some players on this list are all but certain to crack an NHL lineup this fall, the prospects on this list all currently possess NHL rookie eligibility. An unassuming second-round pick in 2015, this Finnish forward being selected 35th overall by Ron Francis raised a few eyebrows. However, Aho quickly rewarded Francis’ faith, spending the entire 2015-16 season as the leading scorer for Karpat in the Finnish Elite League. Despite spending the year as one of the youngest players in the league, Aho totaled 45 points in 45 games and alongside top 2016 draft pick Jesse Puljujarvi, led Karpat to a second place finish in Liiga. After entering the season without many expectations, Aho exploded this year, making the SM-Liiga All-Star team, earning the league’s Best Plus/Minus Trophy, and capturing gold and silver medals with Finland at the World Junior Championships and World Championships. Originally thought to be a skilled player several years away from making an impact with the Hurricanes, Aho’s rapid progression this year has him primed to make the transition to North America as soon as this fall. A speedy forward who can play both centre and either wing, Aho’s two-way ability was the perfect complement to the high-octane styles of snipers Puljujarvi and fellow top pick Patrik Laine. With his high-level hockey IQ, Aho’s production has surpassed all expectations to this point. Despite his small frame (5 feet 11 inches, 175 pounds), Aho is a prime candidate to crack Carolina’s roster next season and with their lack of top-end scoring, could immediately step into a top-six role. Taken with the eighth overall pick by the Columbus Blue Jackets in 2015, Werenski had already played a full season against university-aged competition after fast-tracking his academics to join the University of Michigan a year early. The Grosse Point, Michigan, native stepped up his game in his second season in university, upping his point totals from 25 to 36 and leading the Wolverines to their first Big Ten Championship. Werenski was the best defenseman in college hockey this year, capturing Big Ten Defensive Player of the Year and a slew of accolades with Team USA at the World Junior Championships in Helsinki, Finland. Despite having yet to turn 19, Werenski turned professional after his second college season and signed his entry-level contract with the Blue Jackets in March. It was with the Lake Erie Monsters, the eventual AHL champions, that Werenski fully stepped into the national spotlight. One of the Monsters’ core players during their Calder Cup run, Werenski notched 14 points in 17 playoff games and led all Lake Erie defenders in goals and points. A large-framed blueliner with excellent skating abilities, Werenski has already proved himself too good for both the NCAA level and the AHL. While the Blue Jackets have a nice young core of defensemen under contract, Werenski’s strong play may force Columbus’ hand and allow him to crack the NHL lineup as a teenaged defender. The Winnipeg Jets have built up one of the most impressive prospect pools in the entire NHL, thanks in large part to finding great value at almost every draft pick. A shining example would be Michigan native Kyle Connor, whom the Jets snapped up 17th overall last year after an inexplicable slip down draft rankings. Connor proved why he was so highly touted in his first NCAA season, scoring a nation-leading 35 goals and 71 points. For his efforts, Connor earned a Hobey Baker award nomination, as well as the Big Ten Rookie and Player of the Year awards. For all the excitement Jack Eichel generated in his lone season in the NCAA, Connor was able to match his point total in four fewer games, albeit a year after Eichel had already graduated to the professional ranks. Despite losing out on the Hobey Baker award as the NCAA’s Most Outstanding Player, Connor’s great season earned him a contract with the Jets and he turned professional after just one college season. Connor’s pro-ready game was on display all throughout Winnipeg’s development camp, where he might have been the most noticeable player at all times. The Jets have assembled quite the group of skilled forwards, but Connor’s great speed and nose for the net may make him the best of the bunch. After dominating competition several years older than him last season in college, Connor’s rapid path to the pros should culminate in him cracking an NHL lineup as early as this fall. The elder statesman of the Toronto Maple Leafs’ trio of prized prospects, Nylander was first selected by then-GM Dave Nonis in the 2014 NHL Draft. A departure from the Leafs’ well-known affinity for “truculence,” Nylander’s first full season in the Swedish Elite League cemented him as a future NHL star. The Maple Leafs have exercised patience with this elite prospect, and after brewing in the AHL for more than a full season, they are about to reap the rewards. Nylander flirted with a point-per-game pace in his first year in North America, but really stepped up his game last year, finishing sixth in the AHL in points per game despite missing nearly half the season due to injuries, the World Junior Championships and an impressive NHL cameo at the end of the year. Nylander played in 22 NHL games before being reassigned to the Marlies for the AHL playoffs, posting 13 points while taking the ice for the last-place Leafs. Nylander’s shot, skating ability and smooth hands make him a complete offensive dynamo, and he is all but assured to earn a full-time top-six role entering his third professional season. He was underwhelming in the AHL playoffs as he was dealing with an unfortunate bout of mononucleosis, but he still managed to salvage the Marlies’ season with a hat trick in the Eastern Conference Championships. He’s put up points at every level he’s played, and after showing he was ready for full-time duty last year, there’s no reason to think that won’t continue in 2016-17. After surprising as one of the WHL’s best defensemen in his rookie CHL season, Ivan Provorov was tabbed with the seventh overall selection by the defense-needy Philadelphia Flyers. Despite putting up more than a point per game, Provorov was returned to juniors for 2015-16, a decision that Flyers GM Ron Hextall is now likely patting himself on the back for. Provorov was undoubtedly the best defender in all of the CHL, improving his point total to 73 and posting an astounding plus-64 rating, capturing the CHL’s Defenseman of the Year award in the process. Provorov’s sound two-way game was also instrumental in the Brandon Wheat Kings’ run to the WHL championship and subsequent Memorial Cup berth, although their season ended in heartbreaking fashion (a loss to the rival Red Deer Rebels in the Memorial Cup). Although not the biggest player at 6 feet 1 inch, 200 pounds, Provorov is a fantastic skater with great strength, allowing him to contribute to the play in all three zones. With nothing more to prove at the major junior level, Provorov is likely to play full-time in the NHL next year, a rarity for a teenaged defenseman. The Flyers have been seeking a blue-chip defensive player ever since Chris Pronger’s unfortunate retirement, and they may have found themselves a future star with the smooth-skating Provorov. 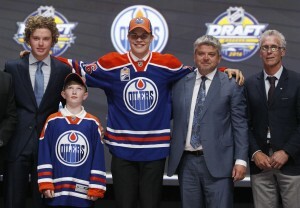 Considered to be a lock for a top-three selection in the 2016 NHL Draft all season long, Puljujarvi was surprisingly passed over by the Columbus Blue Jackets, instead falling into the laps of the Oilers with the fourth overall pick. Despite their need for young help on the blue line, the Oilers jumped at the chance for this fantastic Finn, whose standout draft year was highlighted by a pair of international gold medals and an impressive performance in the Finnish Elite League. Puljujarvi’s draft stock remained high all year long, thanks in large part to a record-breaking performance in Finland’s World Junior Championship triumph (tournament-high 17 points in seven games) and another hard-earned gold medal in the World Under-18 Championships. Despite his young age, Puljujarvi was a key player for Karpat in the Finnish Elite League, putting up 28 points in the regular season and nine more to help his club capture a third-place finish. 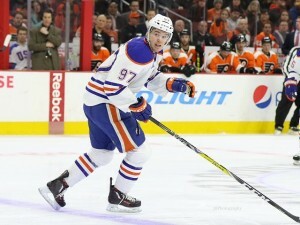 Puljujarvi’s size and skating ability, along with his polished two-way game, have him positioned to be an impact player for the Oilers in the NHL as soon as this fall. While he could stand to gain additional strength and improve his speed, Puljujarvi’s dynamic offensive ability and responsible defensive conscience seem to make him the perfect complement to Connor McDavid and the rest of Edmonton’s offensively gifted core. Dylan Strome, the OHL’s scoring champion in 2014-15, would’ve been a strong contender for the first overall pick in any draft without two potential franchise-altering talents such as Connor McDavid and Jack Eichel. However, the Coyotes were lucky enough to scoop him up with the third overall pick as the aforementioned duo went to Edmonton and Buffalo, respectively. The 6-feet-3-inch pivot was again one of the OHL’s most dominant players last season, as he was the captain and leading scorer of the first-place Erie Otters. Due to missing games from participating in the World Junior Championships with Canada, Strome missed out on a chance to repeat as OHL scoring champion. However, his 111 points in just 56 games were good for fourth place in the league’s scoring race. He also added 21 points in just 13 playoff games, leading the Otters to the conference finals before losing out to the eventual champion London Knights. A cerebral centre who is as effective in the defensive zone as he is on offense, Strome has the projectable frame and high hockey IQ normally associated with a future first-line centre. After dominating his junior competition to the tune of two straight seasons atop the OHL scoring leaderboard, Strome is a prime candidate to lead the upstart Coyotes into a bright future. His playmaking abilities are some of the most exciting of any current prospect, and he could create some magic alongside Max Domi and Anthony Duclair as soon as this fall. If he can gain some size and strength, Strome looks to be the big-bodied first-line centre every team is searching for. It’s hard to imagine a better season than the one Toronto Maple Leafs prospect Mitch Marner just experienced. After finishing second to Dylan Strome in the OHL’s scoring race the year prior, Marner was returned to the London Knights by the Leafs. Sharing captain duties with linemate Christian Dvorak, Marner tallied 116 points in just 57 games, finishing second in the OHL with an outstanding 77 assists. While he missed time due to the World Junior Championships, Marner’s standout year also included two separate point streaks of at least 20 games. In the playoffs, however, Marner cemented his season on the all-time lists, as he posted 44 points in just 18 games and led the Knights to Memorial Cup win with 14 points in just four Memorial Cup games. In total, Marner swept the OHL’s major awards, earning the CHL Player of the Year, OHL Most Outstanding Player, OHL Playoff MVP and Memorial Cup MVP, becoming the first player since Brad Richards in 2000 to earn all four accolades. His smooth hands, great speed and vision allowed him to regularly grace the OHL’s highlight reels as well. While he’s undersized at less than 170 pounds, Marner’s insane skill level and dominance of his junior opponents suggests he’s ready to show off his talents in the NHL. The Maple Leafs will roll out a young lineup this fall, but Marner could be the most skilled of the bunch. He needs to continue to gain strength to withstand the rigors of a full professional season, but Marner has proven himself too good for the OHL. Marner’s high-octane offensive style could make him one of the league’s most exciting players in a few seasons’ time. Speaking of seasons to remember, Patrik Laine’s rise to near-consensus second overall pick in 2016 was fuelled by one of the most impressive draft seasons by a Finnish player in history. Originally thought to be a mid-first round pick, Laine’s great season in the Finnish Elite League earned him Rookie of the Year honours, as he posted 17 goals and 33 points in just 46 games for Tappara. He also starred at the World Junior Championships, tying for the tournament lead with seven goals and adding six assists for the gold-medal winning Finns. Laine’s great season continued into the postseason, where he scored 10 goals in just 18 games and won the league’s Best Player in the Playoffs award, leading Tappara to their ninth championship. Laine proved he’s ready for the professional ranks in the World Championships, where he was named the tournament’s MVP and Best Forward after tallying seven goals and 12 points in 10 games. Laine’s huge frame and intimidating shot are reminiscent of a young Alex Ovechkin. And while Laine isn’t quite as dynamic a skater as the Capitals star, it’s easy to envision Laine becoming a 30-goal scorer alongside the collection of young talent assembled by the Jets. Winnipeg was home to the original “Finnish Flash” in Teemu Selanne, and they may have found his successor in this Finnish offensive powerhouse. It’s been a long time since there was such a positive buzz surrounding the Toronto Maple Leafs, especially with the team’s first last-place finish since 1985 recently completed. However, the team has been stockpiling talented young prospects, and it has culminated in the team’s 2016 first overall selection of Auston Matthews, a strapping young centre from Arizona. Matthews took an unconventional route to the top pick, as he spent his entire draft season playing professionally in Switzerland. Matthews’ play in the United States Development Program had put him in the driver’s seat for the 2016 NHL Draft, as he set the program’s record for goals and points in a season, beating out Patrick Kane, Phil Kessel and Jack Eichel, among others. However, his play in Switzerland proved he could hang around with professionals, posting 46 points in just 36 games and making the league’s First All-Star Team. Matthews also played a starring role in both the World Junior Championships and World Championships for the USA, leading both squads in goals and points. A smooth-skating centre with size, strength and a lethal shot in his arsenal, Matthews’ potential to develop into a franchise centre was too much for the Maple Leafs to pass up at the top of the draft. With a full year of professional hockey under his belt, Matthews is a near-lock to play next season in the NHL, where some say he could’ve even been an impact player last season. With a nice collection of offensive talent being assembled in Toronto, Matthews has the potential to be a high-end first-line centre in the NHL within a few seasons.